CPT Trainer Karen Smalley and her 6.5-year old, male Border Collie, Bodhi, have worked hard to become one of the top human-canine competition tandems in Georgia, if not the entire Southeast. Since Bodhi arrived at Karen’s home as an 8-week puppy, Karen and Bodhi have acquired a lofty resume, including AKC titles, UKC titles, ASCA titles, Flyball titles, and appearances in television commercials, print advertisements, and magazine covers. 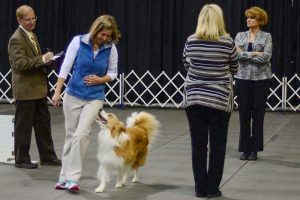 In AKC Rally Obedience Karen and Bodhi earned their Rally Novice (RN), Rally Advanced (RA), and Rally Excellent (RE) titles. Moreover, they have qualified every time they have entered the ring for Rally Obedience competition. As if that isn’t impressive enough, one of their Rally Excellent performances and two of their Rally Advanced performances included perfect first-place scores of 100! In AKC Competition Obedience Karen and Bodhi earned their Novice (CD), Open (CDX), and Utility (UD) titles. Utility obedience, the AKC’s highest competition level is extremely difficult. The exercises include precision heeling, distance work, hand signals, directed retrieving, jumping, and scent discrimination. Success requires years of training, confidence and focus for the dog to work competently apart from the handler, and advanced cognitive abilities for the dog to process hand directions and olfactory information in a highly distracting and pressure-filled show environment. Consequently, only elite dogs and handlers participate. Yet, even amongst the elite, competitors typically require 17 performances to achieve the 3 qualifying legs necessary to earn a title. In contrast, Karen and Bodhi earned their title in their first 3 shows, with 3 consecutive first place scores of 193, 197, and 192! Karen Smalley and Bodhi performing Open off-leash Figure-8 heeling. Photo courtesy of L. A. Freed. 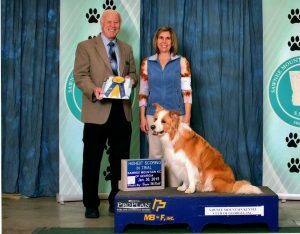 Since earning their Utility title, Karen and Bodhi have been campaigning for the rare Obedience Trial Championship (OTCH) and for the almost as rare UDX and Obedience Master (OM) titles. An OTCH requires the accumulation of 100 championship points that a handler-dog team earn by defeating a sufficient number of UD titled competitors in Open B and Utility B competitions while concurrently placing in the event. The number of points earned per event depends upon the size of the event and the number of opponents defeated. In addition, in the process the team must earn 3 first place finishes under 3 different judges, with at least one first place finish in both Open and Utility. Since achieving their Utility title and becoming eligible for the prestigious OTCH title, Karen and Bodhi have been accumulating OTCH points at a prodigious level. Karen’s first OTCH points came rapidly- the day after achieving Bodhi’s Utility title- when she and Bodhi scored 197.5 out of a possible 200 points in Open B competition, which defeated 17 other competitors and earned 2 OTCH points. She topped that a few weeks later with a High in Trial score of 198 in Open B, which earned 10 additional OTCH points and in March 2017 two (2) additional High in Trial scores of 198.5 which continued her aggregation of points toward the esteemed OTCH title. Karen now has 28 OTCH points. Moreover, they already have their required first place finish in Open, plus 2 additional first place finishes! Bodhi performing the AKC Open Retrieve over the High Jump. 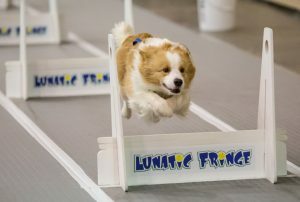 The Utility Dog Excellent (UDX) title requires 10 trials where a UD titled dog qualifies in both Open B and Utility B competitions. Bodhi currently has 2 legs toward his UDX. The Obedience Master (OM) title requires a Utility title and a total of 200 points, where the points are accumulated based on a competitor’s scores in Open B and Utility B competition and where at least 60 points each originate from Open and Utility events. Karen and Bodhi just earned their OM1 title, with an accumulation of 210 Obedience Master points, 150 from Open and 60 from Utility. However, as lofty as Karen’s UD, OTCH, UDX, and OM accomplishments are, that is just the beginning! Karen Smalley and Bodhi have achieved 5 AKC High in Trial (HIT) finishes, which means that on 5 occasions they had the highest score of all competitors in all competition classes. Karen and Bodhi’s first High In Trial. After all their hard work, Bodhi’s official AKC pedigree name is now CH Holther’s Gold Mine, CD, CDX, UD, RN, RA, RE, OM1. And soon we will likely add UDX, and OTCH to his nameplate. Karen has also entered Bodhi in United Kennel Club (UKC) competition, where he earned a UCD in 3 consecutive trials, including one High in Trial finish. 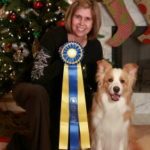 In Australian Shepherd Club of America (ASCA) competition, Karen and Bodhi have earned their ASCA CD and CDX with multiple first place finishes. Bodhi racing to the Flyball box. In Flyball competition, Karen and Bodhi have earned the titles of FD, FDX, FDCh, and the distinguished FDCh Gold. 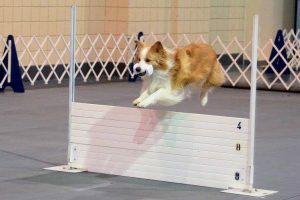 Flyball is an applied obedience competition where the dog must work away from the handler, while traversing designated jumps, retrieving a ball from a mechanical box, and then returning along the jumps to the handler. Furthermore, the dog must remain focused while in a loud building or open field while multiple dogs simultaneously perform the task just a few feet away. Furthermore, away from the competition arena Karen and Bodhi have achieved similar accomplishments. 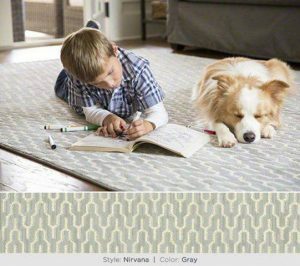 Bodhi has appeared in 2 commercials for Stainmaster Carpet and commercials for Haverty’s Furniture and HGTV. He has also appeared in print advertisements for Pfizer, Murial, Shaw Carpet, and PetSafe and appeared on the cover of Dogs Naturally Magazine and the J & J Pet Supplies catalog. Interestingly, both of the cover shots were photographed by Karen, who excels equally at both dog training and photography. Since there are still plenty of months left in 2017, we look forward to continued brilliance and achievements from Karen Smalley and Bodhi. Most importantly, we are proud to list Karen Smalley as a 20-year member of CPT’s outstanding staff. Karen is vital to CPT satisfying our mission of providing the best training in Atlanta to our pet-owning clients. If you wish to enroll in a Beginner Obedience, Intermediate Obedience, Rally Obedience, or Competition Obedience group class taught by Karen Smalley or wish to schedule private lessons with Karen, please contact the CPT office by email or phone (404-236-2150).